Total newb here! So I've brainstormed a few moves for my hack and I'd like some feedback on how "programmable"
they are in PokeCrystal Disassembly. I just started messing around with it so I don't really have an idea of any preexisting limitations. I'd also like to know if there's some sort of TM or Move Tutor limit if that's alright. CORRUPT - Target becomes disobedient to Trainer. Fails if it is a Wild Pokemon. Effects wear off after switching like Attract or Confuse Ray. PITFALL - Trap opponent underground for one turn (reverse Dig). Fails if used consecutively. DEVOLVE - Target's stats reduced to preevolution's. Fails if no preevolution or used on same target. Wears off on switch or maybe randomly. ASCENSION - Disappear for one turn, attack next turn with different move of choice. Basically Fly but with a twist. Fails if you try to use another semi-invulnerable move. ANTI HEAL - Any healing items (Berries, Potions) will now do damage equal to the amount that would have been healed if used on affected mon. NITPICK - Target can only use moves of its own Type. 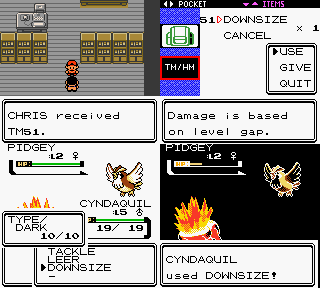 DOWNSIZE - Move does greater damage depending on level difference to target. Base 60 damage of move x1 if equal or less, x1.5, x2.5, x5, x7.5, x10 max. I haven't actually worked out the math yet so change if needed. The nice thing about assembly is that there are technically no "preexisting limitations". It's just a matter of how much code you want to (re)write. TMs are regular items, so to add more, you'll need to replace unused items in constants/item_constants.asm and items/*.asm. Then you assign moves to the TMs in engine/tmhm.asm, and edit the data/base_stats/*.asm files to make TMs learnable. • The TM and HM item constants are mostly sequential, using the very last item IDs. (IIRC, you shouldn't define any non-TM items after the TMs, since an item's "TM-ness" is checked by comparing its ID with TM01) However, ITEM_C3 and ITEM_DC are unused constants that interrupt the sequence. Moving them will simplify things, but you'll have to edit engine/items.asm:GetTMHMNumber and GetNumberedTMHM to not skip over those IDs. Also, HM_08 is unused, so you can go ahead and replace it. rept 2 ; make this "rept 3"
Then you'll have room for 11 more TMs, HMs, or tutor moves. If you need more than that I can help with editing the tmhm macro to allow it. • The "add_mt" macro, used in constants/item_constants.asm and defined in macros/basestats.asm, makes space in the base stats for a learnable-move flag but does not declare a corresponding item. That's because those moves are taught by the the move tutor in Goldenrod City, not by a TM or HM (look at main.asm:Special_MoveTutor for the code). If you run out of item IDs, you can still add tutor moves, but you will have to make sure the tmhm macro inserts enough space for them. As for your proposed new moves, they'll all require custom effects with varying amounts of special code. The ones that involve new volatile status conditions (corruption, devolution, nitpicking, etc, which all heal on switch) will be more complicated. Here's a guide to adding Downsize, which is simpler. • Update battle/move_names.asm, battle/moves/move_descriptions.asm, battle/moves/moves.asm, and battle/anims.asm with your new move. Put it right after Beat Up in all the tables (replacing the unused move 252 or $FC if necessary). It's mostly self-explanatory. Make sure that in moves.asm it has EFFECT_DOWNSIZE. In anims.asm just reuse some other move animation, putting the "BattleAnim_Downsize:" label along with an existing one. • Find the "move effects" in constants/battle_constants.asm and add EFFECT_DOWNSIZE at the end (after EFFECT_DEFENSE_CURL). • Add "dw Downsize" after "dw DefenseCurl" in battle/moves/move_effects_pointers.asm. • Add "command getdownsize" after "command curl" in macros/move_effect.asm. • Add "dw BattleCommand_GetDownsize" after "dw BattleCommand_Curl" in battle/effect_command_pointers.asm. Thanks! You've given me a good starting point, or at least an idea of which .asm files to look at. I should have enough room for all my proposed TMs/Moves to fit with your suggested macro solution for the time being. As for Downsize, it's actually supposed to more damage when the enemy's level is greater than yours, but I'm sure some minor tweaking could fix that. I really like your damage scale btw. It's way more reasonable than 10x lol. I tried making the changes described above to be sure they'll actually work. Here is a commit applied to a copy of the latest pokecrystal that adds Downsize as TM51, learnable by all the starters. Should help as a reference for adding other moves. Just noticed the link to your hack plans. I like your sprites, and you've clearly put a lot of effort into the region design. It's way more reasonable than 10x lol. 60 BP × 5 = 300, which wouldn't even fit in one byte. You could probably make it work anyway, but it would be more complicated and possibly way overpowered. As for your romhack, have you considered Crystal as base to make it easier to do "special" stuff in it using the disassembly? Or are you too invested in your current base for it to be feasible? Pitfall is basically Sky Drop in reverse without damage? EDIT: Making Corrupt work on enemy trainers requires more or less a rewrite of how obediance works I think, which would make it a bit tricky too. @Rangi nice! You sure work fast. Thanks for checking out my stuff btw. For the moves, they're just conceptual at the moment so I'm not too beat up if they don't make the final cut. I'm prioritizing Corrupt, Pitfall, Anitheal, the Always super effective move, and Downsize though. The rest are just extra credit, so to speak. Now that you mention it, Pitfall does share similarities to Skydrop but the Pitfall user isn't incapacitated for the next turn with the target. I pictured it as a kind of 1-2 combo. 1)Bury opponent 2)Use Earthquake or Magnitude. The opponent will be able to retaliate as soon as they're released. You can disable animations by editing gfx/pics/*/anim0.asm and gfx/pics/*/anim1.asm to just contain "endanim", and edit gfx/pics/*/bitmask.asm and gfx/pics/*/frames.asm to just be empty. However, as expected, I was now only able to teach the first 4 out of the 11 new move tutor moves. Does anyone here know why the damage calculations were messed up? I would really like to make all of my newly-added move tutor moves teachable again, without such an issue occurring. Thank you in advance. CurDamage is right after BaseTMHM in wram.asm. The "ds 8" there needs to match how many bytes are being allocated by the tmhm macro. Otherwise the extra tutor flags will overflow into CurDamage. Thank you so very much, Rangi! Seriously, I was racking my brain over this for so long, I thought I would just have to resign myself to adding only 4 new move tutor moves. So, in the future, if I wanted to add even more move tutor slots, I would need to allocate more bytes for move compatibility. I know now that I need to change that aforementioned value in wram.asm, like you just said. However, I am unsure how exactly I should change basestats.asm. I figure it would not be as simple as changing "rept 3" to "rept 4." Also, I wonder if there is a limit on how many bytes I could choose to allocate for move compatibility. In spite of these thoughts, at this point, I am ecstatic simply because of what works for me right now. One byte has eight bits. One assembler variable (the x, y, and z in that tmhm macro) is three bytes. So if a byte of memory can hold eight TM/HM/tutor bit flags, then one variable is needed for every 24 TMs/HMs/tutors. That's why you see checks every 24 TMs to switch to a different variable. As for a total limit, all the base stats have to fit in one bank. So if you get a bank overflow error, you've added one byte too many. However, there are two "unknown" bytes and four "padding" bytes you can remove (just be sure to make corresponding changes to wram.asm). So that's 48 more potential moves. So, I tested out everything you said in your last post. Initially, I did receive a bank overflow error. But, I remedied this by reducing the number of padding bytes from 4 to 3. Everything worked out! Thank you again, Rangi. You have been more than helpful. I will be sure to continue to try to figure out solutions to any future issues on my own.